TORELINA™ A604WR by Toray is a linear polyphenylene sulfide (PPS) grade reinforced with 40% glass fiber. TORELINA™ A604WR meets global regulatory standards for Water (NSF61) and Food Use (FDA) + regional regulations listed in Labels/Agency Ratings below. TORELINA™ A604WR offers low impurity, high toughness, excellent heat resistance, good physical strength, excellent fluidity, good flame retardancy, excellent chemical resistance and outstanding dimensional stability. It can be processed using injection molding. 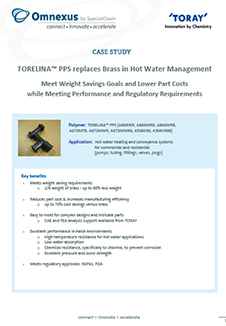 TORELINA™ A604WR is designed for use in hot water management applications for brass replacement, switches, connectors and other electronic and electric components, alternators and other automobile components and in office equipment components including chassis parts and housings.